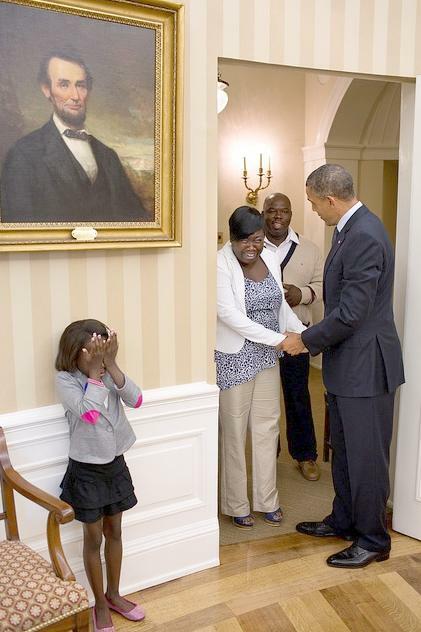 Little Janiya Penny, 8, has her wish granted as she, along with her family, meets the President, August 8, 2012. *President Obama must be one of the most beloved U.S. President’s of all time. Now, in the election season, people are finding more ways to love him. If the children could vote, they would beat everyone to the polls to re-elect him. Some of you may have seen a picture that popped up on Facebook yesterday of a little girl standing near a wall in the White House with her hands over her face as her family walked into a room preparing to be greeted by President Obama. It is a touching photo, but for more reasons than we knew. The little girl in the picture is Janiya Penny. She is eight-years-old and a supporter of Obama that, if she could, would certainly vote for him tomorrow. Janiya is a child that had only one wish and that was to meet President Obama and her wish was granted.